Mosh, which stands for Mobile Shell is a command-line application which is used for connecting to the server from a client computer, over the Internet. It can be used as SSH and contains more feature than Secure Shell. It is an application similar to SSH, but with additional features. The application is written originally by Keith Winstein for Unix like operating system and released under GNU GPL v3. It is a remote terminal application that supports roaming. Available for all major UNIX-like OS viz., Linux, FreeBSD, Solaris, Mac OS X and Android. Line editing of user keystrokes supported. Responsive design and Robust Nature over wifi, cellular and long-distance links. Remain Connected even when IP changes. 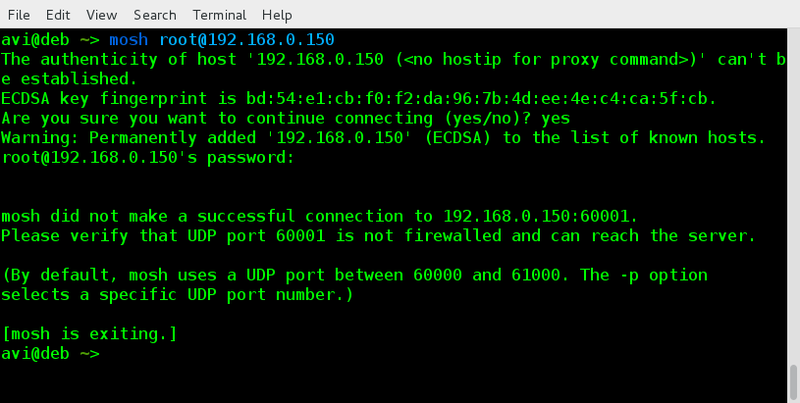 It usages UDP in place of TCP (used by SSH). TCP time out when connect is reset or new IP assigned but UDP keeps the connection open. The Connection remains intact when you resume the session after a long time. No network lag. Shows users typed key and deletions immediately without network lag. Same old method to login as it was in SSH. Mechanism to handle packet loss. 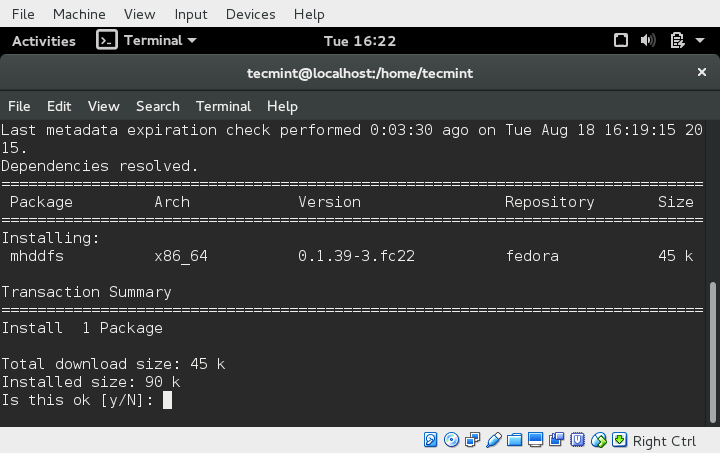 On Debian, Ubuntu and Mint alike systems, you can easily install the Mosh package with the help of apt-get package manager as shown. On RHEL/CentOS/Fedora based distributions, you need to turn on third party repository called EPEL, in order to install mosh from this repository using yum package manager as shown. On Fedora 22+ version, you need to use dnf package manager to install mosh as shown. How do I use Mosh Shell? 1. Let’s try to login into remote Linux server using mosh shell. The preferred way is to open a port and update firewall rules. And then connect to mosh on a predefined port. For in-depth details on firewalld you may like to visit this post. 2. Let’s assume that the default SSH port 22 was changed to port 70, in this case you can define custom port with the help of ‘-p‘ switch with mosh. 3. Check the version of installed Mosh. 4. You can close mosh session type ‘exit‘ on the prompt. 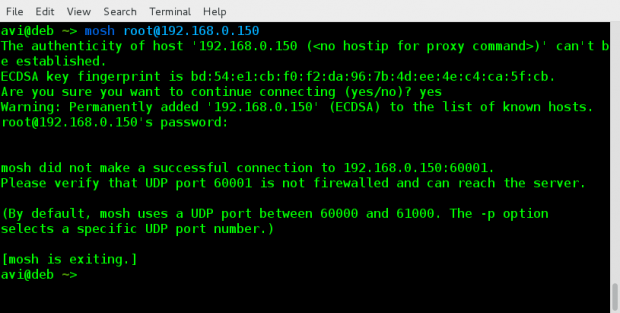 Mosh requires additional prerequisite for example, allow direct connection via UDP, which was not required by SSH. Dynamic port allocation in the range of 60000-61000. The first open fort is allocated. It requires one port per connection. Default port allocation is a serious security concern, especially in production. IPv6 connections supported, but roaming on IPv6 not supported. No support for ssh-agent forwarding. 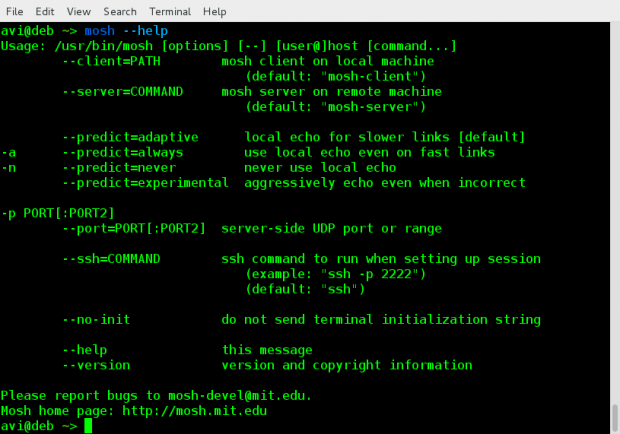 Mosh is a nice small utility which is available for download in the repository of most of the Linux Distributions. Though it has a few discrepancies specially security concern and additional requirement it’s features like remaining connected even while roaming is its plus point. My recommendation is Every Linux-er who deals with SSH should try this application and mind it, Mosh is worth a try. Let’s assume that you have 30GB of movies and you have 3 drives each 20 GB in size. So how will you store? Obviously you can split your videos in two or three different volumes and store them on the drive manually. This certainly is not a good idea, it is an exhaustive work which requires manual intervention and a lots of your time. Another solution is to create a RAID array of disk. The RAID has always remained notorious for loss of storage reliability and usable disk space. Another solution is mhddfs. 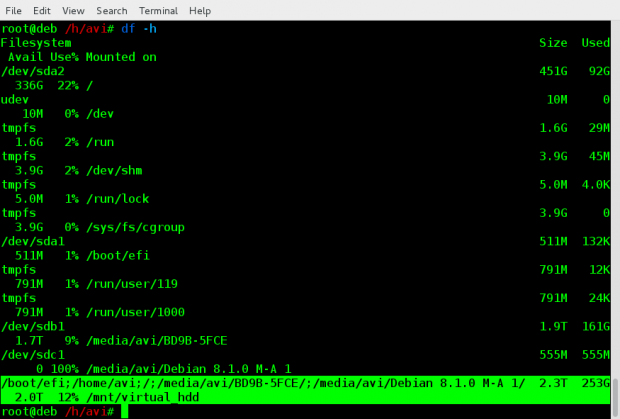 mhddfs is a driver for Linux that combines several mount points into one virtual disk. It is a fuse based driver, which provides a easy solution for large data storage. It combines all small file systems to create a single big virtual filesystem which contains every particle of its member filesystem including files and free spaces. All your storage devices creates a single virtual pool and it can be mounted right at the boot. This small utility takes care of, which drive is full and which is empty and to write data to what drive, intelligently. Once you create virtual drives successfully, you can share your virtual filesystem using SAMBA. Your client will always see a huge drive and lots of free space. Get attributes of the file system and system information. Set attributes of the file system. Create, Read, Remove and write Directories and files. Support for file locks and Hardlinks on single device. No evidence of Data loss No redundancy solution. Add new files to the combined virtual filesystem. Manage the location where these files are saved. 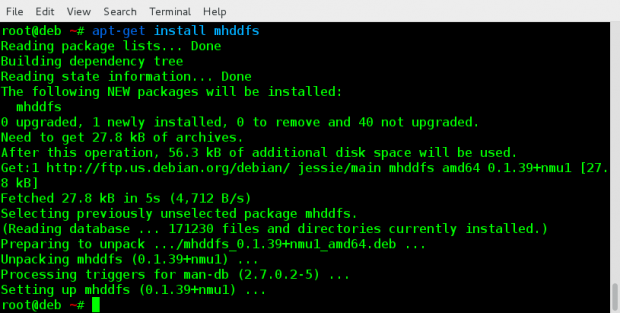 On Debian and portable to alike systems, you can install mhddfs package using following command. On RHEL/CentOS Linux systems, you need to turn on epel-repository and then execute the below command to install mhddfs package. On Fedora 22+ systems, you may get it by dnf package manger as shown below. If incase, mhddfs package isn’t available from epel repository, then you need to resolve following dependencies to install and compile it from source as shown below. Next, download the latest source package simply as suggested below and compile it. 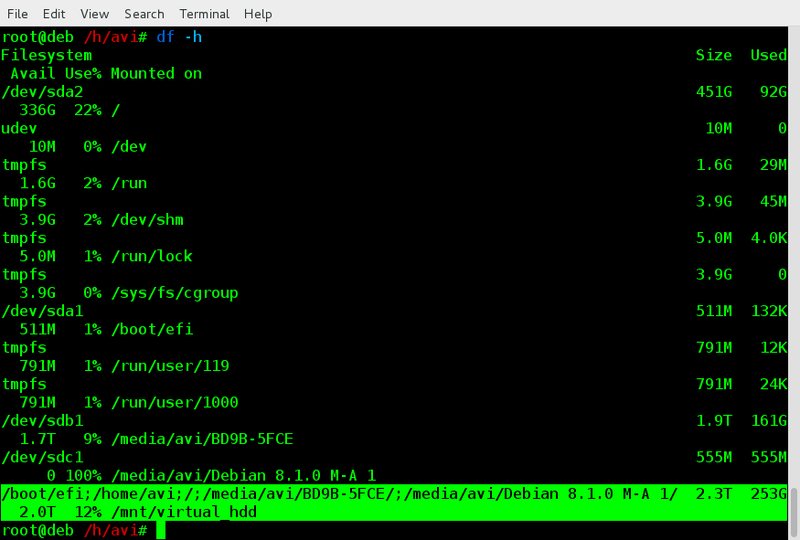 You should be able to see binary mhddfs in the current directory. Move it to /usr/bin/ and /usr/local/bin/ as root. All set, mhddfs is ready to be used. How do I use Mhddfs? 1. Lets see all the HDD mounted to my system currently. Notice the ‘Mount Point‘ name here, which we will be using later. 3. And then mount all the file-systems. Either as root or as a user who is a member of FUSE group. Note: We are used mount Point names here of all the HDDs. Obviously the mount point in your case will be different. Also notice “-o allow_other” option makes this Virtual file system visible to all others and not only the person who created it. 4. Now run “df -h” see all the filesystems. It should contain the one you created just now. You can perform all the option to the Virtual File System you created as you would have done to a Mounted Drive. 5. To create this Virtual File system on every system boot, you should add the below line of code (in your case it should be different, depending upon your mount point), at the end of /etc/fstab file as root. 6. If at any point of time you want to add/remove a new drive to Virtual_hdd, you may mount a new drive, copy the contents of mount point /mnt/virtual_hdd, un-mount the volume, Eject the Drive you want to remove and/or mount the new drive you want to include, Mount the overall filesystem under Virtual_hdd using mhddfscommand and you should be done. How do I Un-Mount Virtual_hdd? Notice it is umount and not unmount. A lot of user type it wrong.